Early adolescence, ages 11-15, is an important stage of development for boys because they are spending more time with peers, developing their unique identity and recognizing strengths. Adolescents are in Erikson’s stage of “identity vs. identity confusion” where heis looking to attain after exploration and soul searching. If an individual does not accomplish this in adolescence they are in a state where he does not know how to identify himself. Adolescents are looking to develop their identity by values, beliefs, and goals he is committed to. In this stage of development, adolescents often ask “what is the real me?” They feel social pressures to display different selves around different groups of people. This also contributes to the enormous weight of peer pressure adolescents feel. They try on many different hats to find the one that fits just right. Self-esteem rises in adolescents due to their feelings of pride, self-confidence, and self-worth. Self-esteem in this stage is based predominately on feedback from peers. Adolescents have been in school for several years, realize what he excels in, and look toward the future with more of a purpose than middle childhood. Adolescents gain an enormous amount of autonomy. Boys separate themselves from the family unit to more of self-governance. Adolescents rely more on oneself and less on parents for guidance and direction to utilize the decision-making skills he has made. Since adolescents spend less time with parents, they spend more time with peer groups. Kohlberg defined adolescent’s moral development in the stage where they maintain approval of friends and family by engaging in good behavior. Although sometimes rebellious, adolescents do seek approval from others for what they have done. Selman’s Stages of Perspective Taking puts adolescents in the stage of “Third Party Perspective Taking.” Adolescents can step outside a two-person situation and imagine how each viewpoint looks from a neutral 3rd party. This is an improvement from middle childhood where he/she can see other’s viewpoint. This means adolescents will stand their ground on a particular side of a discussion, but can see how other’s view both sides. Early adolescence is also characterized by gender intensification where they have increased gender stereotyping of attitudes and behavior. Boys will engage in “boy type” activities with all boys while girls do “girl type” activities with all girls. Young adolescents have increased gender identity mainly due to puberty and how differences in looks appears. Social skills are made up of interaction and communication with others. Social skills are put to use everyday. Increasing social skills for adolescents is important at this stage of life because of their increased interactions with others, emergence of self-esteem and surge of social situations they are involved in. Social skills can increase through coaching, modeling, and reinforcing positive behaviors. 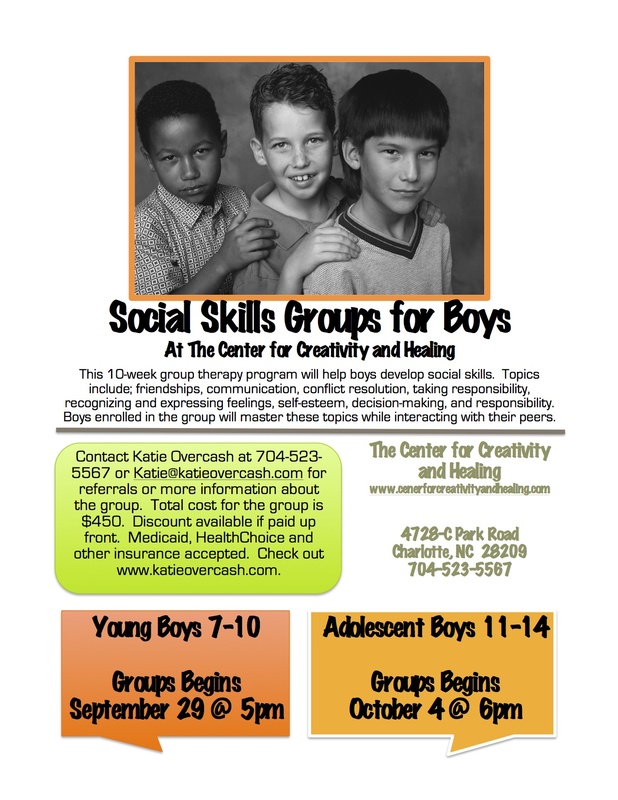 If any of the above competencies are not fully met, boys’ social skills can suffer oftentimes leaving him feeling rejected. Group starts Tuesday October 4th and continues each Tuesday (except November 22) for 10 weeks ending December 13. Attendance at each session is required. Total cost for the group is $450. Payments can be split up each week or full payment before group is eligible for a discount. Ask about a referral discount too! Medicaid, NC HealthChoice, Tricare and some insurance accepted. Please contact for more information. This entry was posted in Uncategorized and tagged Adolescence, communication, decision making, making friends, Mental health, Peer group, self-esteem, Social skills, teamwork, teens, working with others on September 8, 2011 by katieovercash.